Many people experience acid reflux, heartburn or gerd…all related symptoms of a junk food diet, poor digestion, stress, medications, or obesity. Acid Balance was designed to balance the acids and digestive juices… and soothe the digestive tract. 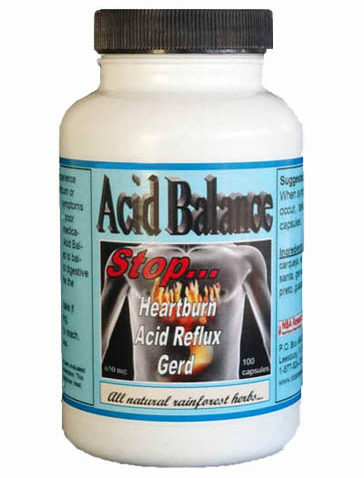 Acid Balance is a blend of seven all natural herbal plants and was specifically designed for those who may have stomach ulcers, and do not do well with natural plant enzymes, which play a major role in proper digestion. Enzymes may irritate the ulcerative condition and cause discomfort. Therefore, Acid Balance can be a temporary relief for overly acidic digestive symptoms and other digestive issues. However, the elimination of junk foods, fried foods, dairy, over the counter meds, healthy weight loss, exercise, and adequate water intake, all contribute to digestive health.